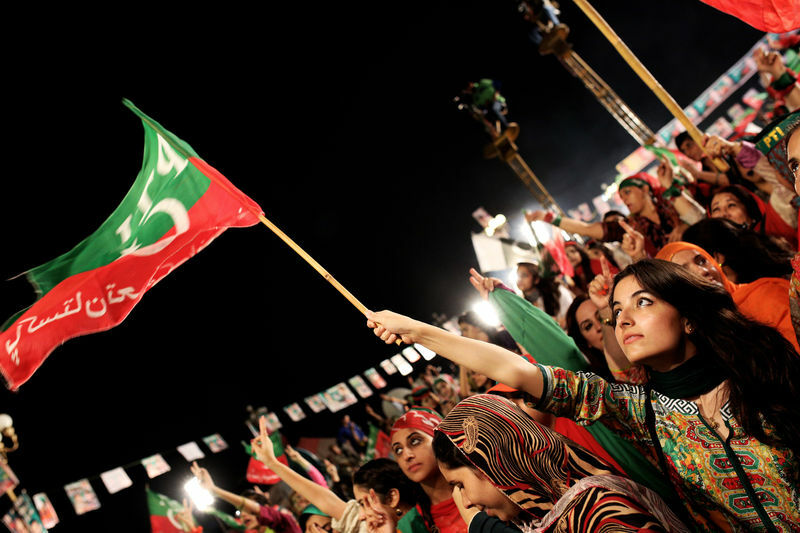 Protesters from two very different political camps in Pakistan have staged a peaceful sit-in in Islamabad since August 14 with a common demand for the resignation of Prime Minister Nawaz Sharif due to charges of corruption and rigging in the election 2013. In response, the government has blocked all routes with sand-filled containers leading to the place of the so-called Azadi March. Popular cricketer-turned-politician Imran Khan leads the party Pakistan Tehrik-e-Insaaf (PTI) and Pakistan Awami Tehreek (PAT) is led by a Pakistani-Canadian Sufi scholar-turned-politician Tahirul Qadri. Both allege that the May 2013 general election, which brought current Prime Minister Nawaz Sharif's party to power in a landslide victory, was rigged. According to Commerce Minister Engineer Khurram, the situation has caused a loss of 800 billion rupees (about 7.78 billion US dollars) to the country so far. However, the authenticity is yet to be confirmed, and some argue the figures are exaggerated. The figures have drastically jumped from 400 billion from mid-August to 800 billion in early September. The federal government has submitted before the Supreme Court that Pakistan has so far incurred a 547 billion-loss (about 5.3 billion US dollars) because of the month-long crisis. “Dharna” is the Urdu word for protest. Industry has also complained that the protests have affected their profits. Saad Mukhtar, of a freight forwarding company, stated that move transporters were reluctant to move consignments between Lahore and Karachi and most of them were not interested in doing business at all. Abdul Basit, a leading poultry businessman of Lahore, estimated 5 billion rupee loss to the Punjab-based poultry industry. As the government placed hurdles and containers on the roads most of them died on their way due to the harsh weather and suffocation. It is expected that this will trigger the increase in prices in the province due to increase in demand and low supply. Farmers also face the burnt of it due to the unexpected death during transportation. Faisalabad contributes the largest share in the textile sector exports of Pakistan, while textile is the leading exporting sector of country. It has suffered heavily as it is unable to fulfill the orders due to delay in delivery caused by the blockage on the roads. The Karachi Stock Market, Pakistan’s largest and one of the best performing stock markets of South Asia, plummeted by 1,300 points soon after the start of Dharna. This is the largest ever fall in the stock value in one day as panic grips investors. Finance Minister Ishaq Dar has also claimed that the political crisis has caused a loss of around 300 billion dollars. Can not believe it all that Azadi March and Inqilab March what a waste of time and waste of economy!!! This nation can never learn…. Swat Fruit and Vegetable Association has requested the political parties to let go of the political differences immediately due to the heavy financial losses by the protests.